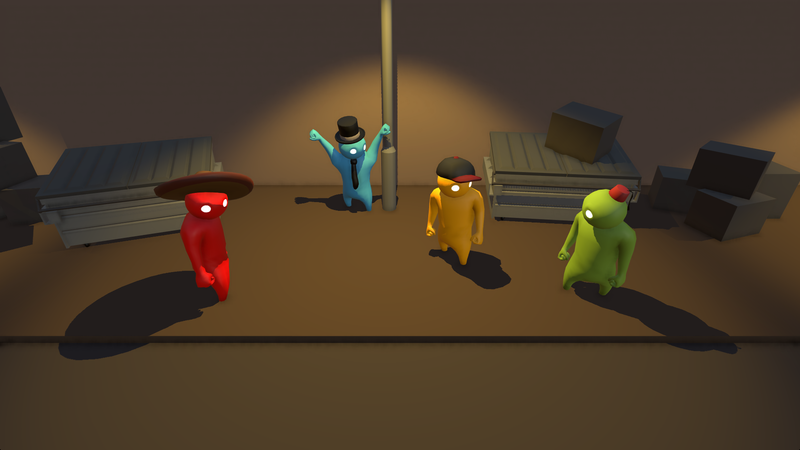 We understand that the people that have read the various comments we’ve made about our plans to try to get the next build of the game finished before August will be disappointed that we haven’t been able to, but it is important that the key character features (climbing, kicking, and stomping) are fully implemented, balanced, and stable for the new stages and environments to work (there are some links to examples of the new character system, characters customisations, and new stages in the list of changes at the end of the post). There rest of this post has information for those that want to know what to expect in the next build of the game or those that want to read specific information on the modifications we've made to the character and games systems to date. We have spent a significant amount of time refactoring and optimising the character system (modifying geometry, joints, and physics forces) to make the character more stable to significantly improve walking on inclines, stairs, and undulating surfaces, and make the climbing mechanic less erratic and more intuitive to control (and to prepare the character for testing a potential water treading mechanic), the revision of the character system was necessary both to implement the additional character moves (slope walking, kicking, climbing etc. ), body shapes and sizes, and to allow us to exclusively focus on prototyping maps and character customisations with less need to frequently pause the making of content, to make additional improvements to the character, this should make it significantly less difficult to manage builds etc. For the full version of the game we plan to make a number of districts e.g. Meat World (the city theme park), the Industrial Quarter (factory and industrial structures), Shopping Mall (Escalators, Shop Fronts, a Food Hall etc. ), the new stages we are working on are an expansion of the Industrial Quarter stages from the pre-alpha prototypes (the Grinder and Incinerator stages), with gigantic industrial fans[vine.co], pipes, cooling towers[vine.co], conveyor belts, steam vents, and other hazardous industrial machinery, a number of the stages have been explicitly designed to test and experiment with the climbing mechanic, and improved character walking on stairs, slopes, and undulating surfaces. Numerous people have messaged us to ask for support for online modes, we want to have support for this but can’t currently commit to support until we have a stable, tested, and working solution (and the resources to support it) it, we are currently working with Multiplay to identify potential schemes for an online implementation but work on this is still at an early stage. We have secured access to developer licences and some of the tools needed to develop for console platforms and will make official announcements about which platforms we are developing for in the coming weeks and months. 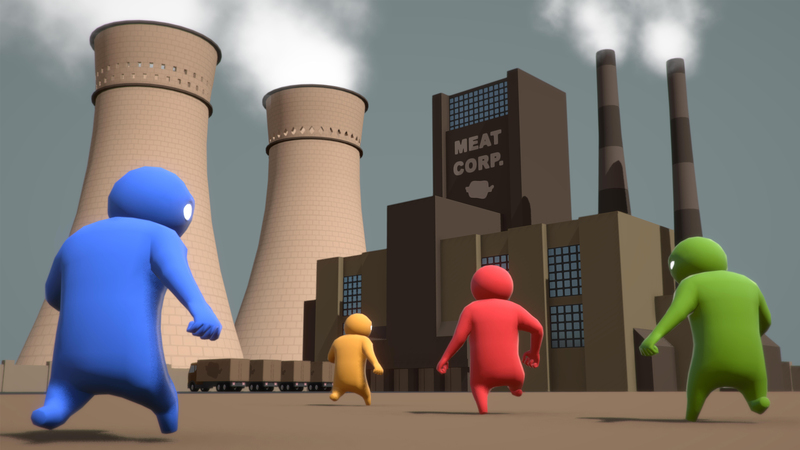 We have taken Gang Beasts to many events in the last few months to promote the game and get feedback directly from players (thank you to everyone that has talked to us and given us feedback on the game); speaking with players at events and watching YouTube gameplay videos has been very useful to us in planning and testing content and mechanics for the game (we have frequently neglected to post about which events we are participating in but plan to share this information in the lead up to events now that we have an office to work form). Three of the four members of Boneloaf went full time in April and started renting a small office in Sheffield, the fourth member Jason has worked his notice with his previous employer and joined us full time in mid-July. In additional to partnering with Multiplay (to work with their networking experts) we have also partnered with an Independent developer that can support us with developing, promoting, and testing the game, we plan to announce this partnership in mid-August. James, Jon, Michael, and Jason. So climbing is a new feature! I thought it already existed 0.0.3, I always tried to climb but always met with failure. :( Waiting for the next build then! Just wanted to congratulate the developers for the great work and the most fun game I've ever played with my friends. Cant wait for the new stages, new game modes e new characters customizations.